Jihadist readying car bomb attacks "to establish Allah's rule in the soil of Allah"
Islamist militants in Bangladesh are preparing to launch car bomb attacks and carry out other deadly missions, one self-described militant commander said in a rare interview with a private television channel. Read more: Jihad "to establish Allah's rule in the soil of Allah"
Americans for Truth Forum recently discovered recruitment videos placed on the official website of the Young Muslims (YM), the youth arm of the Islamic Circle of North America (ICNA), whose contents included an animated graphic of rockets being fired on and destroying the United States, a 9/11 message from “the American Al Qaeda” Adam Gadahn, and previously unseen footage of a paintball range located in the United States used for training Jihadists, just like the FBI discovered at the home of the Fort Dix 6 earlier this week. The Al-Qaeda network had plans to carry out massive terrorist operations in the scale of 9/11 attacks targeting oil facilities in Saudi Arabia, Kuwait and the United Arab Emirates, according to captured militants whose confessions were published in the local media yesterday. An Al-Qaeda front group in Europe threatened on Tuesday to launch bloody attacks in France in response to the election of "crusader and Zionist" Nicolas Sarkozy as president. Cannabis smokers are unwittingly funding Islamist extremists linked to terror attacks in Spain, Morocco and Algeria, according to a joint investigation by the Spanish and French secret services. The finding will be seized on both by campaigners for a harsher clampdown on cannabis and by those who argue that legalisation is the only way to end a petty dealing trend that is dragging growing numbers of teenagers into crime. Anti-terror police arrested four more suspects Wednesday over the July 2005 suicide attacks in London, including the widow of one of the bombers who killed 52 people. Police sources said Hasina Patel, 29, the widow of bombers' ringleader Mohammed Sidique Khan, was arrested by anti-terror police in an early morning raid at her home in Dewsbury. A former Islamic militant has disclosed for the first time the extent of the Al-Qaeda terror network in Britain. NEW YORK -- Six men from New Jersey have been charged in an alleged terror plot against soldiers at Fort Dix, according to law enforcement sources. Investigators said the men planned to use automatic rifles to enter Fort Dix and kill as many soldiers as they could at the New Jersey military base. Fort Dix was just one of several military and security locations allegedly scouted by this group, authorities said. Up to 4,000 terrorism suspects and their supporters are active in Britain, the former Metropolitan Police Commissioner Lord Stevens said yesterday. Lord Stevens said the security service MI5 had recently suggested a figure of 2,000 but the true number was "probably nearer 4,000". Police and MI5 were "still too underfunded and undermanned to cope with the task they face in the decades to come. And that's how long this will last," he said. The "infection" had spread out from "hot spots" such as Luton, the West Midlands and Finsbury Park in London and those involved in the fertiliser bomb plot case which finished this week were "ordinary and British". Home-grown British terrorists have been flying to countries in Africa that do not require visas from London before transferring to Pakistan for training in al-Qaeda camps. There are more terror suspects like the Bluewater bombers loose on our streets THREE men accused of links with Al Qaeda and the Bluewater bomb plotters are on the loose in Britain, it emerged yesterday. 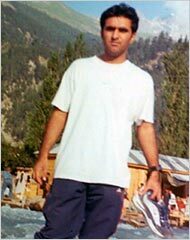 LONDON, May 1 — Omar Khyam, the ringleader of the thwarted London bomb plot who was sentenced to life imprisonment on Monday, showed the potential for disaffected young men to be lured as terrorists, a threat that British officials said they would have to contend with for a generation. An in-depth poll of four major Muslim countries has found that in all of them large majorities believe that undermining Islam is a key goal of US foreign policy. 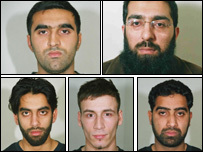 Five men have been found guilty of plotting to kill hundreds in an al-Qaeda-linked bomb plot. The international conspiracy included links to the 7 July 2005 London bombings. Two other men on trial at the Old Bailey were found not guilty. Five men have been jailed for life for a UK bomb plot linked to al-Qaeda that could have killed hundreds of people. Turkey's Islamist-rooted government sharply criticized an army threat to intervene in domestic politics and said on Saturday the military must remain under civilian control. A school in Amsterdam has halted lessons on rural life because the Islamic children refused to talk about pigs. Reporting this, Alderman Lodewijk Asscher said he wants to take "tough measures." Subsidies for all kinds of dubious groups must stop and parents of unruly children penalised financially. Four British men pleaded guilty on Wednesday to charges of conspiring to cause explosions in a case linked to that of a Briton jailed last year for plotting to blow up the New York Stock Exchange. The men -- Junade Feroze, 31, Mohammed Zia ul-Haq, 28, Abdul Aziz Jalil, 34, and Omar Abdul Rehman, 23 -- pleaded guilty to conspiring with Dhiren Barot between February 2001 and August 2004 to cause an explosion or explosions, the court said. "Suspected of inciting terrorism abroad and raising money for terrorists." LONDON (AFP) - British police arrested six men in pre-dawn anti-terror raids Tuesday, including radical Muslim Abu Izzadeen, known for calling western leaders "terrorists" and heckling Home Secretary John Reid. 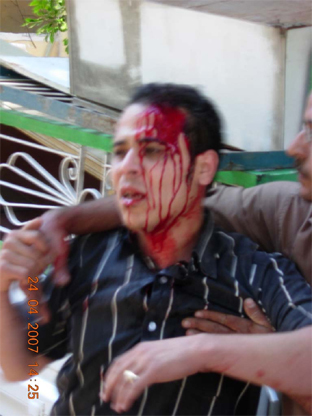 Muslims attack Christians in the presence of Police in Dair Mawas, Egypt. A crowd of Muslim fundamentalists attacked Christians who were officially regaining control over on of the houses which were illegally occupied by Muslim fanatics in Dair Mawas since 1986. The house belongs to the family of Eng. Adly Abadeer. Eng. Adly Abadeer is the Head of Copts United in Zurich and also known as the Elder of Copts in the Diaspora. Read more: Muslims attack Christians in the presence of Police in Dair Mawas, Egypt.